NaanSense food truck offers delicious Indian food, made from scratch every day, and always with the best ingredients and never with anything artificial. We are 2 chefs who set out to bring affordable, authentic, Indian food to the streets of Seattle. Sourced locally whenever possible, we prepare our food with only all natural ingredients and love. Follow us on Facebook or twitter for our awesome daily vegetarian and non-vegetarian specials. We hope to see and serve you soon. Our menu is seasonal, and changes according to ingredients available locally. We also offer daily Vegetarian & Non-Vegetarian specials. Be sure to come early, as these items sell out quickly! Below is a sample menu from our truck. Contact us for our Drop off Catering Menu, Custom Menus available for Catered Events. If you're looking to feed a large group and want the full NaanSense experience, then we can bring the truck out to your event. Truck availability is dependent on time and day of the event and has a starting minimum order of $1500. The NaanSense truck launched in August of 2014 after several years of planning and preparation. We started the truck not only because my wife and I were tired of working in restaurants and the often late nights that it required, but also because we both share a passion for great food. We both left other higher paying industries to go to culinary school (which is where we initially met) and pursue our true passion. 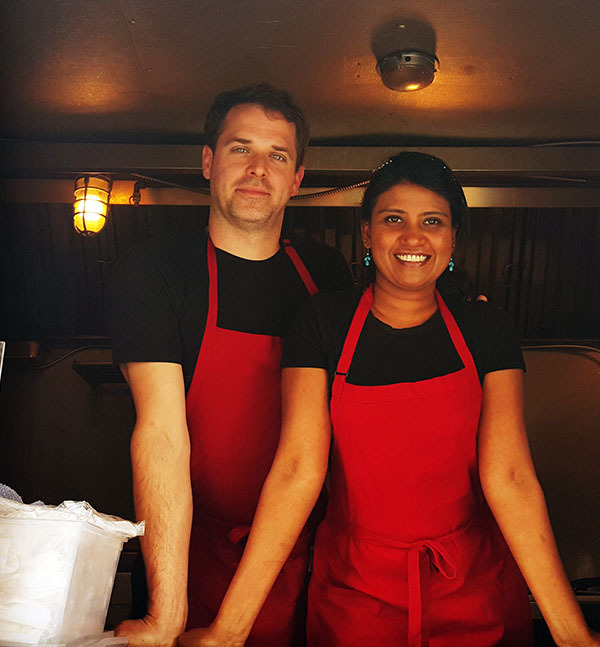 Starting a food truck has allowed us to once again work together (I initially hired Anitha as my Sous while I was the chef at Phoenecia in Alki) and do so in a way that allows us to also have somewhat of a normal life outside of work. We decided to do an Indian Food truck because we felt there was a real gap in Seattle when it came to good Indian food. Far too many places use artificial ingredients (such as food coloring) and lower quality ingredients and we don't believe it has to be that way. We set out from the beginning to break the current norm on Indian food in Seattle and move away from the idea that it always has to be an all you can eat buffet. We use only all natural ingredients (no food coloring, no soy products, and no processed foods), we source ingredients as locally as possible, we support local whenever possible such as Shepherds Grain (who we are huge fans of), and still remain affordable. We have structured our menu to allow flexibility in ordering so that you as the customer can decided how much food to order and how much to spend. We also have designed our truck from the beginning to be able to serve food quickly as we know your time is valuable. This is the best Indian truck food I have had in Seattle. they're not only my favorite truck to get food from, but my favorite Indian food across the board. They're reasonably priced, give you a bunch of food, and the quality is just outstanding. Hands down the best indian food truck in Seattle. Their chole is authentic punjaabi and their saag paneer tastes like the paneer was homemade. Naan is freshly baked and is so fresh and fluffy. Very efficient and quick service.